Stephen Hawking, noted physicist who made groundbreaking theories on the structure and nature of the universe has finally had his wich come true to experience zero- or more accurately, micro-gravity. He flew in a plane which dived to allow passengers like him to literally float as if in outer space where gravity is negligible. The plane took off from the same runway where the Space Shuttle lands at the Kennedy Space Center. 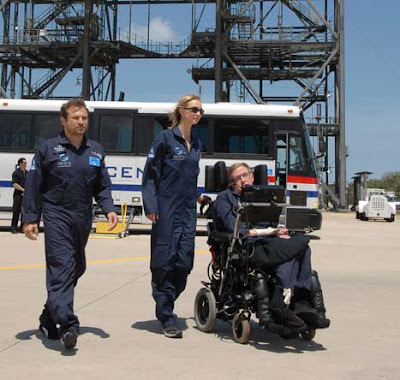 Hawking suffers amyotrophic lateral sclerosis disease which cost him use of his muscles. He talks with a machine. Make Like a Chicken in Front of Your PC!